Sesame oil is obtained for the Sesame seeds that are acquired from a flowering plant belonging within the genus’ family called Sesamum or benne. Botanically Sesame seed is known as “Sesamum indicum”, it is the seed that is believed to be the oldest oil seed crop that has been cultivated for more than 3,500 years. In India Sesame seeds is known as “Til” or “Tila”, it is mostly used as an edible vegetable oil beside for offering to a God and making sweets. Sesame oil in Hindi is called “Til Ka Tel”, Sesame seeds have a great importance in customs and rituals as well as medicinal uses. As customary Sesame seeds are used to make sweets called “Laddu” or “laddoo” in Makar Sankranti. The seeds are blended with jaggery also known as “Gud” or “Gur” in hindi or with palm sugar or sugar, it is made into balls and are eaten as a snack. This sweet is offered to neighbors, friends or relative. It is an expression of being lived together in tranquility and joy in spite of the solitary and distinctions between individuals. As a ritual, it is used for offering to god. 1. Brown Seeds : This type of seeds is well known for its high content of oil; it has around 45-50%. This type of sesame seeds is mostly used for extraction of oil that is extensively used in India. 2. Black Seeds : This type of seed is known for its rich flavor. This type of sesame seeds is usually used as a seasoning in salads, to steep vegetables and meat and also for therapeutic purposes. 3. Red Sesame Seeds : This type of seed is known for its rich aroma. This type of sesame seeds is usually used in dishes to enhance the taste. 4. White Seeds : This type of seed is well known for its nutty flavor. This type of sesame seeds is usually used for baking purposes and to flavor food, it is mostly found sprinkled over buns cakes. Sesame seeds are known by different names in India and in different parts of the world. Below are some commonly using names of Sesame. Sesame Seed Oil is very popular in Asian countries and people are well aware of its healing properties. It has many health benefits; the uses have dated back thousands of years. There are innumerable ways that can be used to better our health while also fighting off bacteria and other pathogens that affect our skin. Fresher studies show that til oil benefits in many ways for different ailments, it is helpful in the treatment of Diabetes, Migraines and Hepatitis and even athlete’s foot. Below are some of the other health benefits of Sesame Seed Oil. Sesame seed can be the best food that can make your bones and joints strong. According to a study, published in the American Journal of Clinical Nutrition “osteoporosis” (condition of fragile bone) is generally caused due to low dietetic intake of zinc and low blood levels of the trace minerals. Sesame seeds oil are full of calcium, copper,magnesium, vitamin B1, dietary fiber and zinc thus they contribute to the bone mineral density. A tablespoon of whole sesame seeds hold in about 88 mg of calcium. Where else a quarter cup of raw sesame seeds has 351 mg of calcium. On the other hand; one cup of non-fat milk has 316.3 mg and one cup of full milk has only 291 mg of calcium. Sesame seeds have the most nutritional value when the entire seed(un-hulled) is used. So using it cannot only be useful for bone-related diseases or fracture, but it also strengthens the bones. Are you looking for the ideal anti-obesity medication that would yield sustained weight loss with minimal side effects? Sesame seeds are the best. Including few sesame seeds to your food can stop on going extra pounds and will also help to reduce weight. You may be surprised how til oil benefits in weight loss; it is due to its major component’s protein and “lignan” in it. Lignan in sesame seed acts as the hypocholesterinemic agent who plays an important role to reduce weight. This Sesame binds to and stimulates a receptor in the body called peroxisome proliferation-activated receptors (PPARs) which are involved in controlling of lipid metamorphosis. Due to the function of “PPAR” alpha in body increase gene expression of the fatty acid oxidization enzymes. In simple terms, Sesame increases the fat-burning process and reduces the storage of fat on the body. So it is a good idea to include at least some protein at every meal and snack when you’re trying to lose weight. Most people like younger-looking face that makes them handsome and beautiful. However, few people undergo from aging in their early twenties with most common marks like wrinkles, fine lines and dull face. You may wonder how Consuming sesame seeds or til oil benefits to solve these problems; it is due to its zinc properties in it. The Zinc is an essential mineral that is required for producing collagen and gives skin additional elasticity. Sesame seeds contain tocopherols, the major “vitamers” of vitamin “E” that increases lifespan and promote healthy neurons. Zinc, furthermore, fixes damaged tissues throughout the body and calcium, minerals, magnesium, iron, copper, Vitamin B1 in it nourishes the body internally. 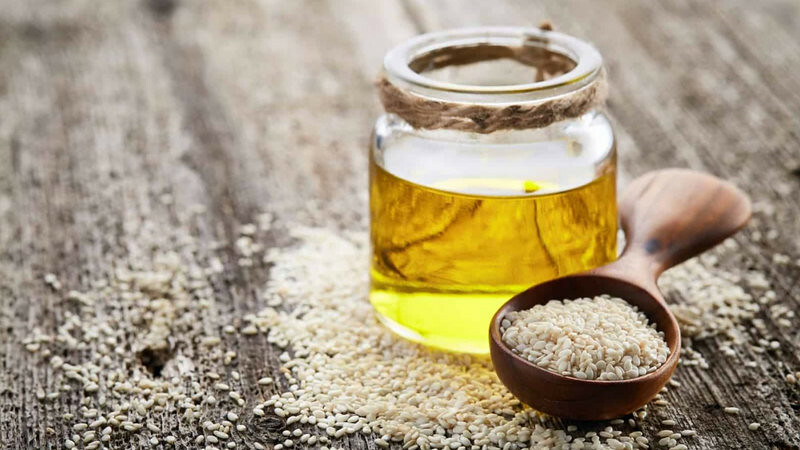 In addition, sesame seeds oil have antioxidant properties that help to fight with free radicals and slow down the aging process within the body. It additionally aids to close small pores on the skin and contributes a beautiful glow to the skin. In Ayurveda uses of Sesame oil for healing wounds has a history more than 5,000-year-old . It has natural antibacterial and anti-inflammatory properties that help to heal wounds fast.Oil of Sesame seeds if applied to body surface or taken orally possess wound healing activity. It is moreover, helpful in healing the parts of mild scratches injures and wounds.Besides wound healing, it can be helpful in various kinds of healing & non healing ulcers, eruptions, sinus, fistula, etc. Sesame oil helps to control eruptions. The vivo studies revealed that daily supplement of sesame oil helps in lowering of oxygen-free radicals and lipide peroxidation. In a Study, it has been found that free radicals are formed during a process of healing and often damage tissues. It was also found that sesame seeds as well as sesame oil helps in wound healing by promoting the wound and had epithelialization effect on the mice. Traditionally, the paste of sesame mixed with ghee, and honey is recommended to be applied over the wound to hasten ripening. In Ayurveda, Sesame oil has been traditionally for oral care such as gums and teeth treatment; it is recognized as Kavala and Gandusha that can be compared to gargle. Sesame oil is an important oil that has been traditionally used for oil pulling, it a treatment that is used for strengthening gums, teeth, bleeding of gums, prevent dental decay, lip cracking and dry throat. Many people believe that oil pull required long time, but Ayurvedic doctors suggest that if it is performed regularly only 2-3 minutes, or even up to 5 minutes is enough. It is not necessary that you must do it for 15 to 20 minutes, as it is a part of the dinacharya part. Make sure you do not swallow the oil. The clinical study was carried on Sesame oil activity, among the plaque induced gingivitis. It has shown a reduction in the total colony count of aerobic micro-organisms. Rinsing the mouth with sesame oil has lessened gingivitis by 85% reduction in the bacteria which causes gingivitis. Sesame seed oil is used for more than just cooking. It is found in most commercials as well as the homemade product for the hair and skin care. It is generally found in sun care oils, bath oils, shampoo, foot scrubs, soaps, massage oils, ointments, creams, lotions and more!